TALLAHASSEE – During the final Cabinet Meeting of his administration, Gov. 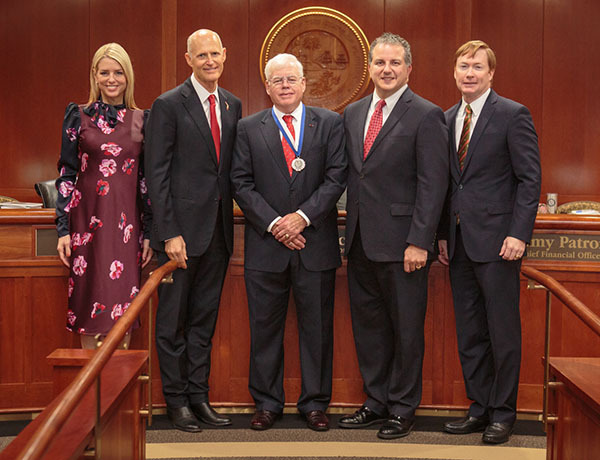 Rick Scott recognized three Florida veterans with the Governor’s Medal of Merit. Retired Army Lt. Col. Glenn W. Sutphin Jr. entered active duty service as an enlisted soldier in 1969, received his commission as a Field Artillery Officer, and finished his military service in the Florida National Guard. The colonel, who is qualified in five branches of the Army, led soldiers in seven operational deployments during his 30 years in uniform before retiring in 1999. His personal awards and decorations include the Legion of Merit, three Meritorious Service Medals, three Army Commendation Medals, an Army Achievement Medal and four Humanitarian Service Medals. 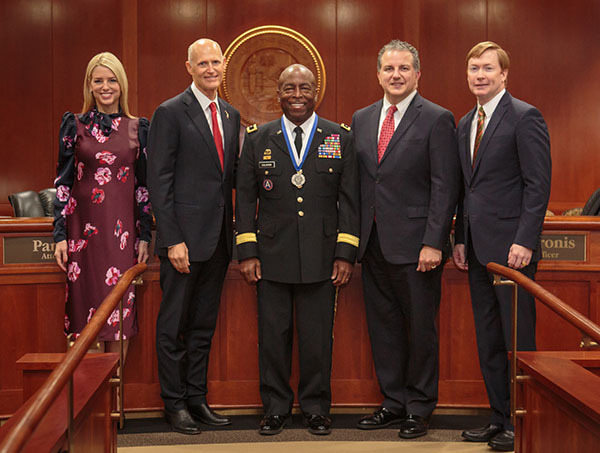 He is a recipient of several National Guard decorations, including the Florida Cross, the Florida National Guard’s highest award. On Aug. 2, 2016, he was appointed by Governor Scott as Executive Director of the Florida Department of Veterans’ Affairs. Retired Col. Charles Mohr is an Army veteran who enlisted in the Florida Army National Guard in January 1949. He advanced to the rank of Master Sergeant prior to his discharge on March 14, 1954, when he accepted his commission as a Second Lieutenant, Infantry Officer. He retired at the rank of Colonel in 1986. His military awards include the Legion of Merit, Meritorious Service Medal, Army Commendation Medal, Army Achievement Medal, Humanitarian Service Medal, Armed Forces Reserve Medal with two hours glasses, Reserve Components Achievement Medal with three bronze clusters, NCO Professional Development Medal with numeral one, Army Service Ribbon, Reserve Component Overseas Training Ribbon with numeral three, Florida Cross, Florida Distinguished Service Medal with silver cluster, Florida Commendation Medal with silver cluster, Florida State Active Duty Ribbon, Florida Recruiting Ribbon and the Florida Meritorious Service Ribbon with silver cluster. 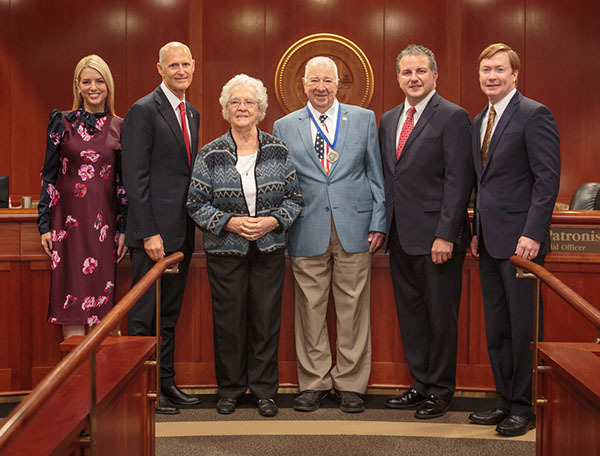 Now, Colonel Mohr is a tireless advocate for veterans through the Tallahassee Lions Club, the Florida National Guard State Family Readiness Advisory Team and the Military Officers Association of America. Maj. Gen. Michael A. Calhoun assumed duties as the Adjutant General of Florida on March 29, 2015. He previously served as the Assistant Adjutant General-Army and as the Director of the Joint Staff for the Florida National Guard. Following graduation from Florida A&M University, General Calhoun enlisted as a Private in the Florida National Guard in August 1977. After a six-year break in service, he received a direct commission and appointment to 1st Lieutenant in the Medical Service Corps on July 22, 1989. His follow-on assignments include Chief of Pharmacy Services, 131st Mobile Army Surgical Hospital (MASH); Executive Officer, 131st MASH; Logistics Officer, 50th Area Support Group (ASG); Director, Host Nations Support, 50th ASG and Director, Support Operations, 50th ASG. General Calhoun deployed with the 50th ASG in 2003 as Director of Host Nations Support during Operation Iraqi Freedom and served as Deputy Commander, Task Force (FL) in Mississippi during Hurricane Katrina.